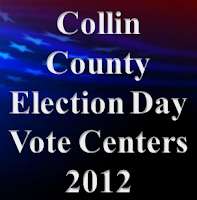 Collin County had countywide "Voting Center" polling locations on Election Day, November 6th, 2012. Election Day Vote Centers worked like Early Voting polling locations where voters living anywhere in Collin County could vote at any of the 67 Voting Centers open around the county on Election Day. This is a follow up to our November 5th article, Collin Co. Election Day Vote "Anywhere" Centers. A few locations had wait lines during the day and through out the entire day. Plano's Carpenter Park Recreation Center location opened with approximately 150 people already waiting in line. The last person to join that line at 7:00 a.m. Tuesday morning, as the Judge called "the polls are open," waited about 70 minutes to vote. The Carpenter Park Recreation Center wait line ranged from over 70 minutes to about 40 minutes through out the day. About 140 people were waiting in line at that location at 7:00 p.m. Tuesday evening, when the Judge called "the polls are closed." The last person in that closing line voted at 7:50 p.m.
Posted below the "Read more »" jump are the Vote Center ePollBook voter check-in counts. This count does not include manually processed provisional ballots or voters who surrendered their vote by mail ballot to the Election Judges, so they could cast an in-person ballot. Has The GOP Lost A Generation Of Voters?